Throughout most of our lives we go through events or situations that change our outlook or inspire us in a way never before felt. The loss of a loved one in particular can change the mind-set and lives of those closest to and most effected by a death. For some the change can be a difficult and darkening process, for others it is a call for change and motivation for the better of those around us. Indy Car racer and Andretti Autosport driver, Ryan Hunter-Reay, whom lost his mother in a fight with colon cancer, used his experience as motivation to step up and join the battle against cancer. “Racing For Cancer is something that’s extremely important to me, it started with me and a friend of the team. We got together and formed Racing For Cancer as my mom was struggling with her fight against colon cancer,” explained Ryan. “She ultimately lost that fight and it really inspired us to do a lot in the fight against cancer and for the cancer community and we’ve done a lot for that at the racetrack, it’s huge,” he added. The former Barber Dodge Pro Series Rookie of the Year is not alone in his fight, with the tight knit Indy Car family behind him, proceeds and awareness have sky rocketed over the past year. Since losing his mother, Hunter-Reay has dedicated his life and passion of racing to cancer research and development. His Indy Car number “28” was chosen to represent the 28 million people fighting the same battle his mother had lost, and he continues to take steps forward as he was named a LIVESTRONG Global Envoy in April 2011, to represent the entire motorsports community. By putting on big events at major Indy races, Ryan has encouraged numerous drivers and those in the audience to do what they can to make a difference. 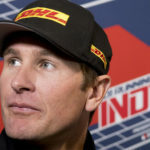 Hunter-Reay’s relationship with LIVESTRONG is something that he hopes and anticipates will grow stronger as time passes, while continuing to use his place in Indy as a platform for awareness. “They really have the outreach that we’re looking for to gain momentum and raise funds. LIVESTRONG is the more powerful charity and that’s the one we’re concentrating on as well,” said the 2008 Indianapolis 500 Rookie of the Year. “It can go many different ways, I just want to do whatever I can while I’m in the position that I’m in driving race cars, driving in the Indy 500. It’s the world’s single-day biggest sporting event so we have to use that to really make a difference and make the difference against fighting cancer,” he added. There is no denying the fact that Racing for Cancer has already made a positive and effective impact on the development in research for cancer and it will continue to be a leader lap after lap until the race can finally come to an end. “I have a passion because of what I’ve lived through with my mother. My mom died really young, she still had half her life to live. The worst part about cancer is the way it kills you. It’s horrible; I wouldn’t wish it upon anyone. I really have a passion for it. I’m still almost angry about it and that really burns that fire to make a difference. Every person has a cancer story and we have to change that,” concluded Hunter-Reay.